Over the past few years many books by ex-military writers have been released to great acclaim. It has become difficult to pick which ones to read. As someone with no close personal ties to anyone in active service, I find the subject deeply fascinating for the very reasons Kakutani mentions. Former Explosive Ordnance Disposal (EOD) officer Brian Caster is one of the writers featured in the New York Times article. Castner is the best-selling author of The Long Walk, and with his new book, All the Ways We Kill and Die, he solidifies his place as one of the best military authors writing today. 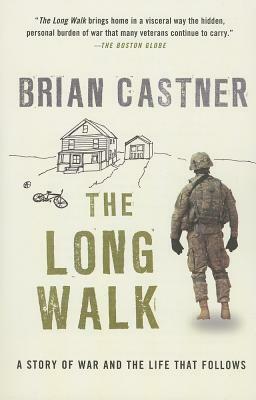 Castner’s first book, The Long Walk, chronicles on his deeply personal account serving three tours of duty in the Middle East as commander of the EOD unit in Iraq. Rather than detailing the specifics of the various campaigns he led, the book focuses primarily on his postwar experience and the psychological struggle he faced returning from war. In telling the story of his friend’s death, Castner profiles the struggling widow, two war amputees, female biometrics engineer, a bomb-maker, a contractor for hire, and, in one of the more fascinating and stunning sections of the book, a drone pilot. With these detailed accounts, the book pieces together the story of “The Engineer,” the man responsible for the bombs. 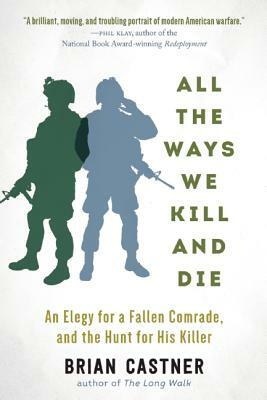 Considerably more technical than his first book (a 7-page glossary in the book helps readers navigate Arabic, military jargon, and acronyms), All the Ways We Kill and Die is a book that brings readers backstage, intimately unveiling modern warfare in a way that is completely fresh. Castner’s books are a must read for anyone wanting to know more about the real individual lives of the soldiers who fight the wars of today. Join us at the Lake Forest Park store on Monday April 4 at 7pm to meet Brian Castner. 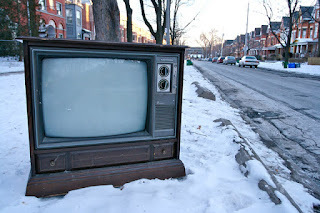 Erin and I recently found ourselves in a high-pitched conversation around our shared love of Canadian television and resultant frustration of its categorical dismissal in the American cultural colloquy, if it's considered at all. It was a conversation so animated it scared other booksellers into hiding, which is a shame because Canadian television is worth a little shouting and you guys missed some great recommendations. Namely it was our shared love of Don McKellar that brought us to a tremulous fervor, most specifically my bark bark barking about his most recent series, Sensitive Skin. 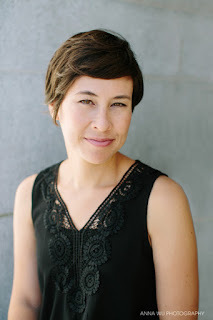 McKellar plays Al Jackson, a newspaper columnist who writes light, humorous cultural criticism and is invited to sit on a literary award's panel. In his typical fashion, Al overanalyzes his responsibilities and presents full-blown dissertations on each nominated book, only to be mortified upon realizing the other, more esteemed panel members dismiss each submission with a single repudiation of "garbage," "terrible," etc. Adding to my already immeasurable delight that a sitcom would incorporate a literary award was the brief cameo of author Barbara Gowdy as a panel member. It was a two second appearance that sent me reeling into a two month rediscovery of a staggeringly talented and original writer. Enormously esteemed in Canada (and Germany, apparently? 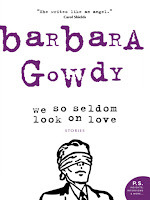 ), Gowdy is widely read and critically hailed for her luxuriant prose that nestles against tales revolving around the darker human impulses. Our neighbors to the North celebrate her work as most American literary institutions praise Eggers, Egan, etc. So why, in almost twenty years as a bookseller, have I only encountered a total of four other readers who know who the hell she is? That boils down to one every five years and, especially after rereading the majority of her work for the blog, the obtuseness of her work and reputation became increasingly lamentable with each passing sentence. 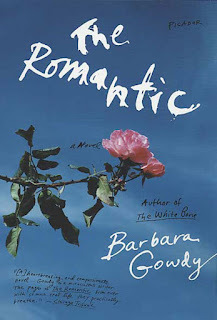 Barbara Gowdy became known to American readers with her fifth book, The White Bone, which has remained a fairly popular book club selection since its release almost twenty years ago but it is her story collection, We So Seldom Look on Love, that is the most fitting entry point to what she does best. A collection full of tales that seamlessly shift between the lyrical and the macabre, it is also her most exaggerated; each narrative carrying the haunting, ominous air of an Ennio Morricone score. An uncompromising otherness inhabits each story, a situation or description that feels abrasive and utterly foreign, almost pornographically close, yet undeniably attractive. There is something shocking in the sheer beauty with which Gowdy translates her supremely discomfiting material: the awkward, almost grotesquely detailed physicality of a truly unlikable behaviorally disabled foster child; a necrophile's desires stripped of their brutal implications by the author's intoxicating ability to seduce the reader; the humiliating rebellion of every young person's body is taken to a narrative nightmare alley of extremes by the presence of a pair of small, extremely delicate extra legs growing out of the young protagonist's torso in "Sylvie". What makes these stories, and all of Gowdy's work, so remarkable is her very singular ability to make us question and examine just how far it is a person has to travel before repugnance gives way to attraction. And, occasionally, how terrifyingly short that trip is. 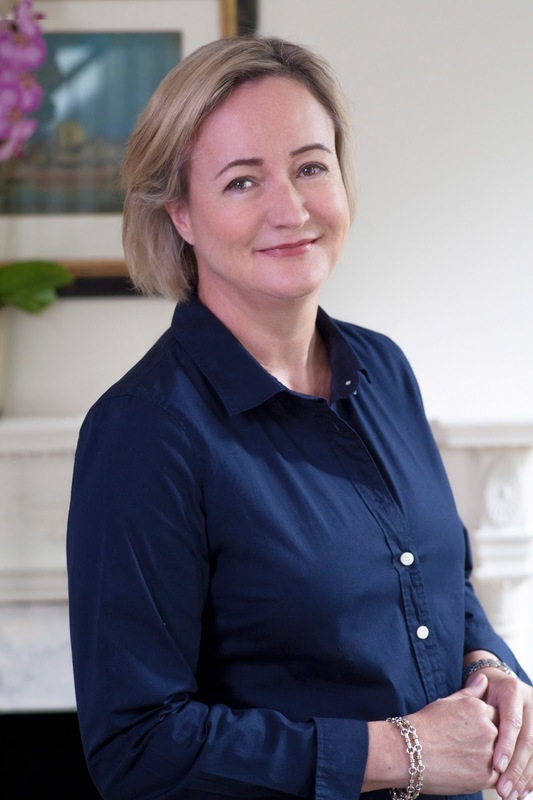 In all of her work, the beautifully undulating atmosphere and refined tone is Gowdy's greatest strength and she is working at the height of her powers when she relaxes and focuses not on our physical oddities but our emotional deformities, The Romantic being the best example. Nominated for the Man Booker, it is a coming-of-age novel whose foundation is built on an ominous, broiling darkness brightened only by the protagonist's persistent grasp on pragmatism and emotional compartmentalization, the book finding its heartbeat in that juxtaposition. I am rudely startled. That something so glamorous could be contained in something so loathsome offends both my sense of fair play and my nervous grasp of cause and effect. As in her more unconventional work, there is also a wonderfully unexpected sense of play at work in the novel's underpinnings. The character of Aunt Verna, the sister of Louise's father, who arrives to relieve some of the familial tension brought on by the mother's fleeing infuses the novel with a little humor, broadening its emotional scope. A loud, brash, intensely demonstrative woman, Verna is a former private investigator whose crowning achievement was solving a case for the actress Sophie Tucker, "whose kidnapped Siamese cat [she] single-handedly located, bound and gagged but alive, in a hotel laundry hamper." While willing to shine some light here and there, for Gowdy it is the devil in the details that is most enticing. She seems to have an endless wealth of eloquent but gruesome vividity at her disposal. Most often, Gowdy's touch is a finer, sneakier thing. Hints of darker things to come, a nascent sense of dread, is illustrated in the every day: after Louise's mother intentionally fails to provide enough chairs for dinner guests and enjoys the ensuing awkwardness, it feels symbolic of the growing discord in the family, a warning shot. Other times the imagery is overt, like Louise's deflowering, a sensation "like a hundred tiny bones snapping" (those same broken bones are conjured again soon after in the depiction of the resultant fetus and its "bones brewing" inside her). Abel continually exposes tiny freedoms and unexpected beauty to Louise, making it difficult for her and the reader to decide if it is Abel himself that is so addicting to her childhood self and shackles her to a lifetime of unflagging devotion, or if she is simply looking to sustain that adolescent sense of wonder. But conscious or not, Louise's driving force is undeniably her faith in Abel, though he seems to desire nothing but absolute self-obliteration. They both romanticize the void, the vacuum created by the oneness of their impulses and insatiable appetites for their respective objects of desire. I found myself wholly immersed and devoted to both characters, oscillating wildly in my opinion of whose addiction is costlier and, as a result, struggled to recalibrate to my physical surrounding when setting the tale aside. 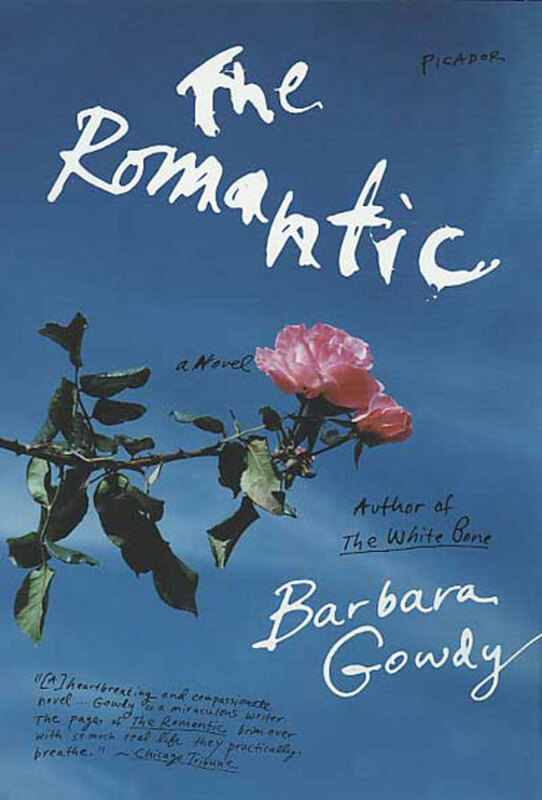 And therein lies Gowdy's magnificence - her characters, no matter how familiar or difficult to translate they may seem, are woven into the reader's everyday tapestry with the most exquisite subtlety. Such effortless grace and depth are a gift to any reader and to plate darker, subversive tales and sticky morality plays on fine bone china would expose most writers as barbarians. Gowdy, though? Her murkiness is dressed in a deceptive prettiness, a loveliness that draws the reader in only to leave them abandoned on the side of a dark, unfamiliar road with no idea how such a lovely Sunday drive could end so unpleasantly. That ability to manipulate her audience, to infiltrate their subconscious and rewire their perceptions and expectations of how a plot should unfold or what a story's hero should be makes it easy to draw comparisons to Canada's most famous literary export, Margaret Atwood. 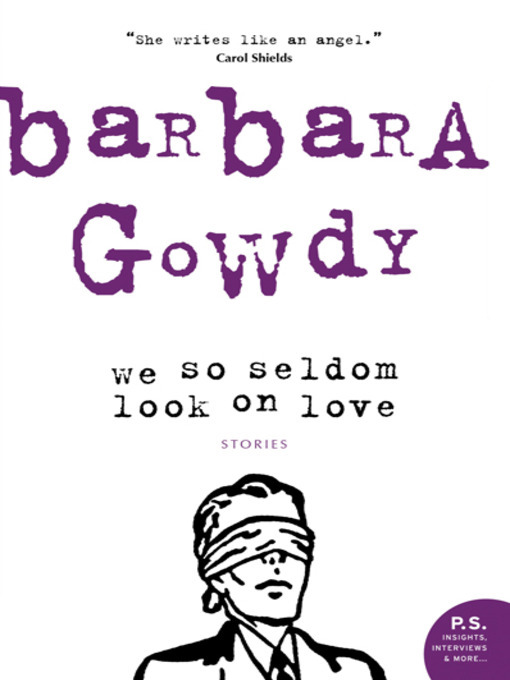 But Gowdy is Atwood's cooler but possibly emotionally unstable step-sister: full of sharp edges, intimidatingly unpredictable, occasionally cagey in morality but ultimately an elegant, beguiling mystery. 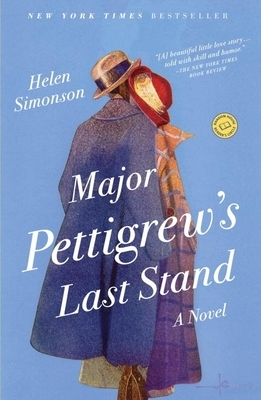 The release of Helen Simonson’s first novel since Major Pettigrew's Last Stand is perfectly timed. Just as America’s dramatic obsession with Britain’s World War I-era idiosyncrasies is left behind by the finale of Downton Abby, we get The Summer Before the War to put us right back in the English countryside. The Summer Before the War takes place, literally, the summer before World War I breaks out in 1914. But in Sussex, where the small towns and hamlets seem so removed from the violence of the Ottoman Empire, the most controversial thing to happen is the arrival of a young, attractive, female Latin teacher. 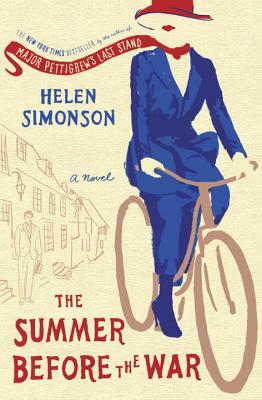 Coming off the heels of Simonson’s first triumph with Major Pettigrew, as well as its reminiscence of Downton’s characters and imagery, Simonson’s new novel is already receiving high praise. In preparation for her appearance at our Lake Forest Park store on March 30th, we asked her what she’s been reading now that her novel’s hitting shelves. It’s a new series we’re going to feature on the blog and in our newsletter, but we thought Simonson would be the right author to start things off. Maybe it's possible to find new pockets of time for reading? I've just discovered that on a plane I can read a real book all through take off, landing and that endless waiting on runways for the ground crew to get back from lunch and open the gate. And what am I missing - mindless TV or the humiliation of snoring in the middle seat? Among the high-flying books I've read? Try The Swans of Fifth Avenue by Melanie Benjamin, a fascinating portrait of betrayal for Truman Capote fans. I've read and re-read My Name is Lucy Barton by Elizabeth Strout (just nominated for the Bailey's Prize) because it's a master class in creating a unique voice. And I've been lucky enough to read advance copies of Everyone Brave is Forgiven, by Chris Cleave (coming May) and Homegoing by Yaa Gyasi (coming June). The former is a gripping World War II story of love and duty set in London and the siege of Malta and the latter is a stunning debut exploring the history of slavery in Ghana and tracing many generations; including those who remained and those who were shipped as slaves to America. With books as good as these, my new reading habit just might stick! Please join us on Wednesday, March 30th at 7:00PM, for Helen Simonson in conversation with local fave, Jennie Shortridge. Labels: Author Interviews, Author Visits, Events, What Are You Reading Now? Historical fiction has always been somewhat of a literary enigma for me. You can mention it in the same breath—for better or worse—as other genre fiction staples: mystery, thriller, romance, etc… But, at the same time, it often belongs on the same shelves as literary juggernauts. 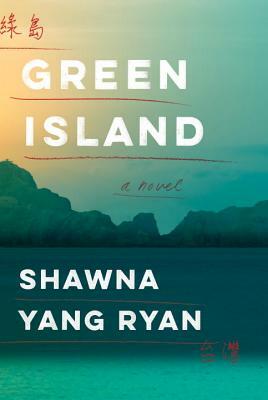 Take Shawna Yang Ryan’s The Green Island: it is deeply influenced by Tai-Pei’s troubled history and begins amid a nationalist uprising in 1947. It is, by all accounts, at least part historical fiction as its plot and narrative are wrapped up in real world historical events. But, like all good genres, The Green Island transcends its own boundaries and slowly turns into literature with a capital ‘L’. Shawn Yang Ryan is currently on a west coast tour for The Green Island and visited the Lake Forest Park store last month. Her audience spilled out of the den and into the regular stacks. But because the prose in her book is so lush and lyrical, the reading remained intimate as lookers-on continued to arrive. It got me thinking: what is it about historical fiction that seems to capture audiences and readers differently than other genres of literary fiction? Because historical fiction is defined by its genre elements, it can be hard, sometimes, to take it seriously as literature. Literature, as opposed to thrillers or detective novels, is defined precisely by its lack of genre archetypes: it provides subtly complex characters in familiar, though inflated, situations. The questions literary novels ask evolve and expand throughout the reading. Meanwhile, genre novels deal with clear questions posed at the start: Who killed the guy? Will they fall in love? Is that a ghost? Historical fiction, however, includes both structures. The Green Island begins by asking what will happen to Tai-Pei and then continues to explore how the events of 1947 effect us today? This is why Ryan’s audience was so large and so engrossed. As a society, we are still wondering what will happen as North Korea continues to flop rockets into the South China Sea and as the U.S. signs over our commitment in the Trans-Pacific Partnership. The questions posed in Ryan’s lyric narrative continue to echo. What keeps us reading a mystery is the nagging need-to-know. But what keeps us turning the pages of The Green Island? We already know what happens, historically. Many people are, in fact, still living through it. But like all readers of literature, we want to know that our experiences are not an anomaly, rather shared and universal.